Ever since we saw the bubble burst in the Tallahassee real estate market, we have closely monitored the success rate for home sellers. 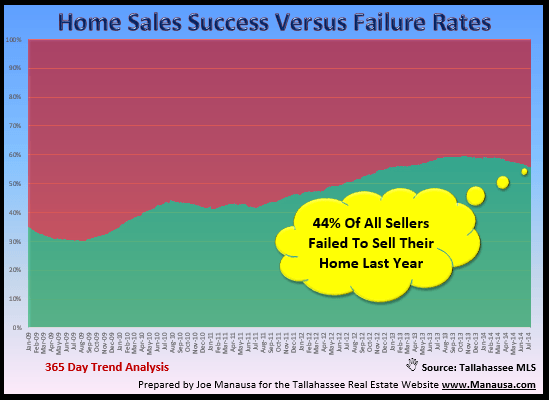 You see, most people think their home is “sold” the day they hire a real estate agent, but the sad reality is that a large percentage of the homes for sale in Tallahassee will fail to sell by the end of their initial listing period. 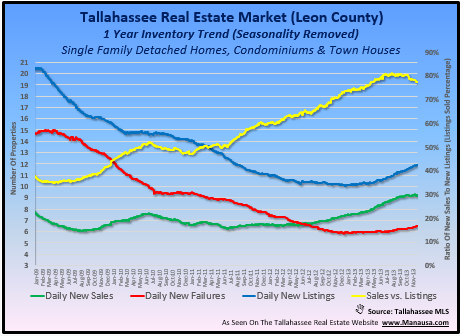 In order to develop a better method of selling homes and to demonstrate the current competitive conditions of the real estate market in Tallahassee, we have produced two graphs that help us monitor the difficulty in selling a home. Our first real estate graph shows that the home seller’s success rate is on the decline. The graph shows 100% of the homes that “leave the market.” Simply put, it takes homes that see their status change from active (to something else) and categories them into one of two groups. Houses either leave the market because they sold, or houses leave the market because they did not sell (expired, canceled, withdrawn, etc.). Do you want to have a 59% chance of selling your home, or do you think it’s worth your while to find better odds? Our next graph shows why we are seeing the trend reversal for home sellers. The blue line shows the one-year trend of daily new listings, while the green line shows the trend for new sales. The yellow line shows the ratio of sales to new listings, and we can see that it has reversed direction in the past few months. Why? Because more sellers are willing to test the market, and the rate at which buyers were returning to the market has recently slowed. In a nutshell ... supply is beginning to outpace demand again, and we had not removed the glut from the market (yet). The National Association of REALTORS has reported that 64% of home sellers hired the first agent with whom they spoke about the job of selling their home. Why don’t more homeowners comparably shop to ensure they are going to get the best home selling solution? 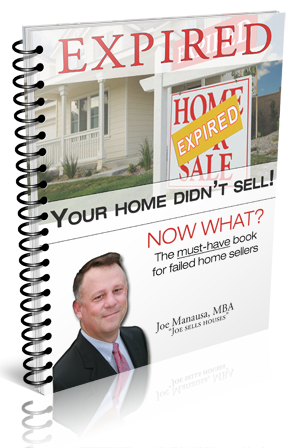 The problem is so bad that I have prepared a 59 page e-book titled “Your Home Did Not Sell! Now What?” and I provide it to our readers for free. It lays out information and a plan on how to hire the real estate agent that will get you top dollar for your home. It shows the modern processes for selling a home, and it instructs you how to find and interview the best candidates for the job. Remember, you are going to spend (tens of) thousands of dollars to sell your home, so make sure you get your money’s worth. Demand the very best internet marketing plan for selling a home, and make sure you are working with a company that can deliver ready buyers to your door. If you would like better odds than the current success rate for home sellers, just drop me a note and we will make immediate contact with you to see how we can help.